The Lazy Monkeys is a smoking-friendly guesthouse in the centre of Amsterdam, surrounded by numerous bars, restaurants, coffeeshops, cafes. 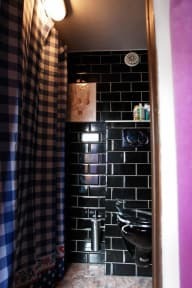 Our rooms are furnished with double or single beds, loft-style or not, a choice of a private or shared bathroom. There is a cable TV, DVD, mini-fridge, free WI-FI, smoking equipment. 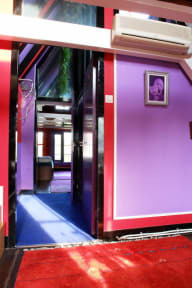 The Lazy Monkeys offers a true Amsterdam experience to easy going and independent travelers. -Your reservation must have the correct arrival time in order to be checked in. Please inform us of any changes regarding your arrival time and provide a correct contact phone number. -All reservations are subject to 6% city tax. Laszlo was a great host! I understand why people like to stay at Lazy Monkeys! The room was nice and comfy! It's located right in the center - supermarkets, restaurants and coffeeshops all around. Perfect for a few nice days in Amsterdam! Laszlo war ein sehr netter Gastgeber und bei den Beratungen über die Aktivitäten sehr fachkundig. Jederzeit wieder!